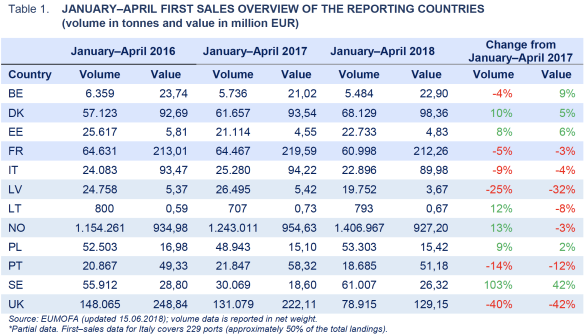 In January‒April 2018, first-sales value and volume increased in Denmark, Estonia, Poland and substantially in Sweden over the same period in 2017, whereas they dropped in France, Italy, Latvia, Portugal and the UK in the same period. The price of fresh salmon imported by the EU from Norway continued to decrease, reaching 6,51 EUR/kg in beginning of June. 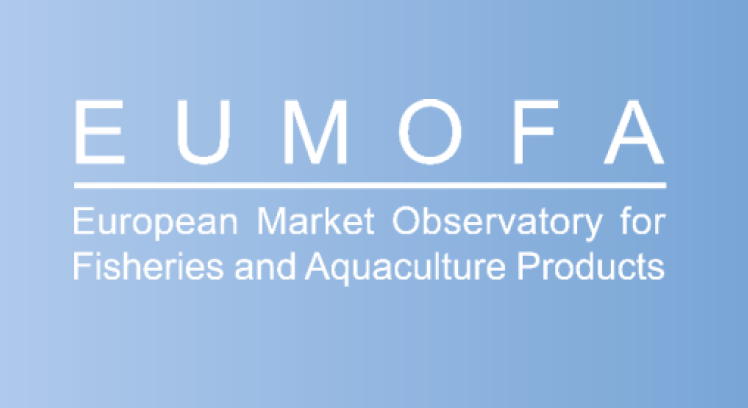 Tropical shrimp from Ecuador also continued its decline, hitting 5,76 EUR/kg. The EU is the largest market for seafood from the Faroe Islands. Despite an increase in export volumes, the Faroese export share to the EU has since 2010 trended down from 57% to 41% in 2017. 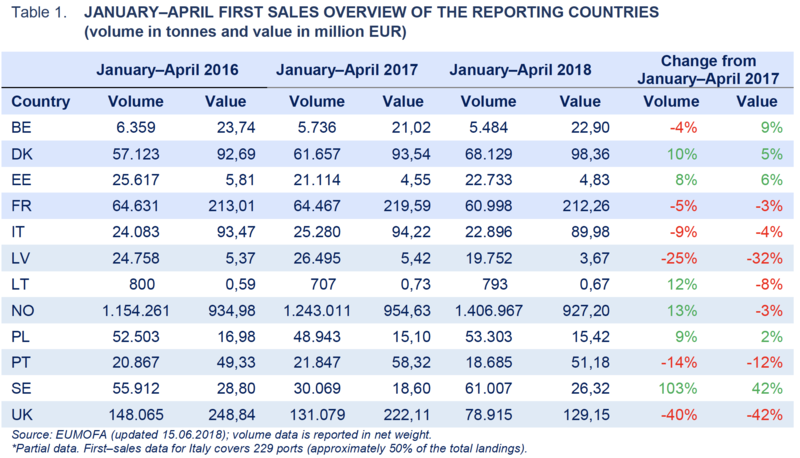 Increases in value and volume: Denmark, Estonia, Poland and Sweden saw growth in first–sales value and volume. 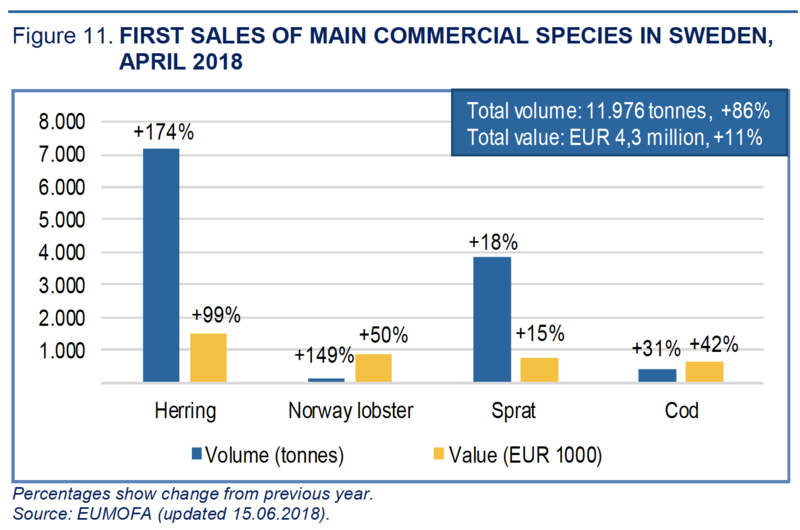 In Denmark sales grew by 5% in value and 10% in volume because of high supplies of mackerel and mussel Mytilus spp., whereas in Sweden, they increased 42% in value and 103% in volume, due mainly to very good catches of herring. This rising trend continued in April 2018 but in a lesser extent. Values and volumes increased the most for herring, cod, and Norway lobster. Prices decreased significantly for Norway lobster (−40%) as well as for herring (–27%). They increased moderately for cod (+8%), reaching 1,58 EUR/kg. 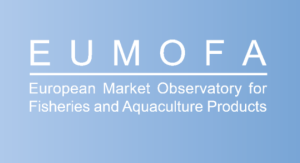 In March 2018, the consumption of fresh fisheries and aquaculture products increased over March 2017 in both volume and value in Denmark (+11% and +16%, respectively), Germany (+28% and +30%), Hungary (+106% and 108%), Ireland (+4% and +6%), Italy (+1% and +3%) and Sweden (+57% and +38%). The high consumption growth recorded in Hungary is due to the Easter holidays, when a consumption peak is usually registered, especially for carp. In 2017, when Easter was on 16 April, Easter holiday purchases took place in April. 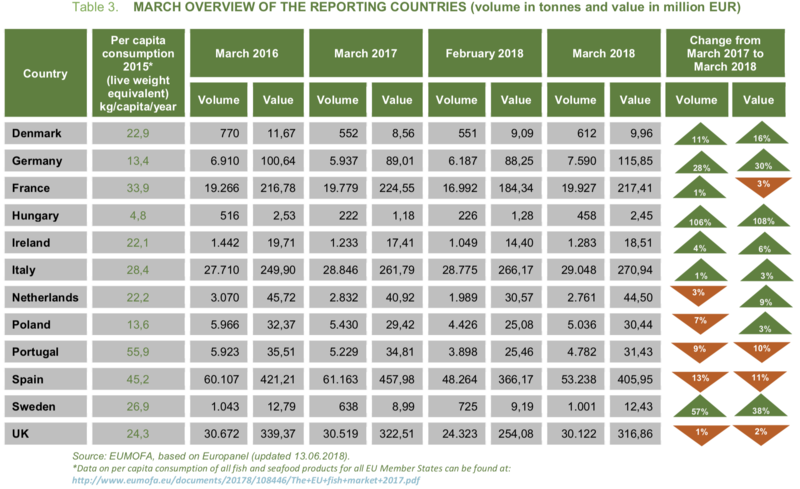 While in 2018, Easter was on 1 April and purchases took place the week before, the last week of March, which explains the high peak of consumption in March. In France, volume increased by 1% and value decreased by 3%. In the Netherlands and Poland, the opposite trend occurred. Volume decreased by 3% and 7%, respectively, and value increased by 9% in the Netherlands and 3% in Poland. Consumption decreased in both volume and value in the rest of the Member States surveyed. 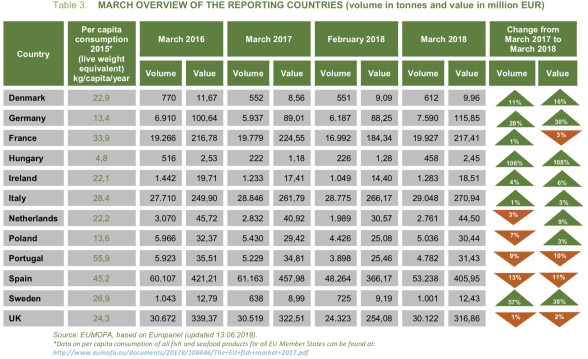 Compared with February 2018, in all the Member States surveyed, both value and volume increased. The greatest increase was registered in Hungary (+91 and +103%, respectively), and the Netherlands (+46% and +39%).